Today we bring you the biggest of our boys, with his new toy, a Blackberry Storm. 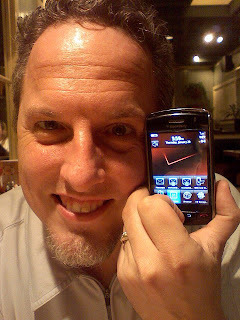 For several months Michael has agonized over whether to jump on either the iPhone or Blackberry bandwagon. He's had a Palm PDA for the last 14 years, and it truly is his brain. He uses it, and uses it hard. In his case it is a tool rather than a toy, and one he really can't live without. However, it was time for a new device thanks to a string of problems with his Palm Treo, including a huge reduction in tech support. In the end he chose the Blackberry because it was a better fit for the way he uses his info. He's pretty happy, as you can plainly see, with his brand new toy. We all went out to dinner (the first time in weeks! I'm doing great on the resolution to eat at home more often!) and we had awful service, so-so food, and we were all disappointed that it took an hour and a half to get in and out. The kids only picked at their "kid's menu" food and both declared they like my cooking better. This is a huge, enormous, gigantic compliment that encourages me to continue coming up with meals to cook and eat at home. I'm surprised. I never make "kid's food" so you'd think they'd be more excited to have corn dogs, french fries, and mac n' cheese whenever they can get 'em, right? But no, they like my Nasi Goreng, Bruschetta, or Parmesan Encrusted Chicken. Go figure. It's amazing that the encouragement of these two boys inspires me to come up with all new culinary delights. Nathan recently requested Sushi, after tasting a classmate's in-class creation. Whoa-boy, that there's crazy talk! my kids also say my home cooking is their favorite. they actually say their favorite place to eat is at our "home restaurant, because everything mommy makes tastes good". i do however have evidence that says otherwise. they're not that picky though.